SADDLE FIT VIDEOS - Caldwell Saddle Co. It is imperative that the shoulders hold the weight of the rider and the saddle. When ONLY the back is holding the weight, this can cause muscle atrophy as well as nerve damage. This picture is an example of the damage a bad saddle fit can cause. 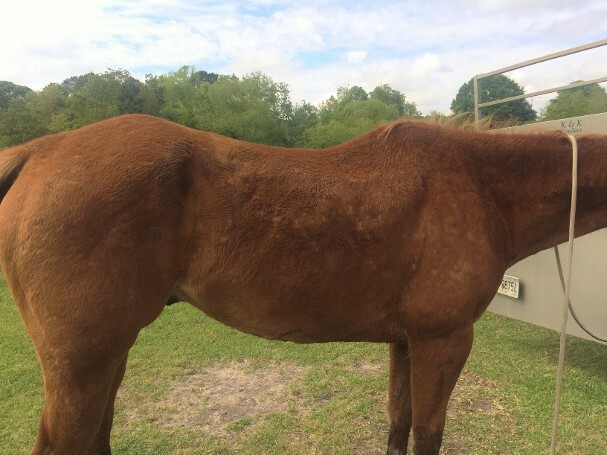 The muscle area along each side of this sorrels' spine can easily be seen in the shape of the ill-fitting narrow tree in which he has been ridden. The sad thing is once this back atrophies like this, when someone plops a narrow saddle on him and it fits down into the grooves already eaten into his back, folks will say "Wow, look how great that saddle fits down!" Note also the endema (swelling) under the atrophy. Topline pressure on nerves and tissue will cause trembles in the front legs often leading to tripping.